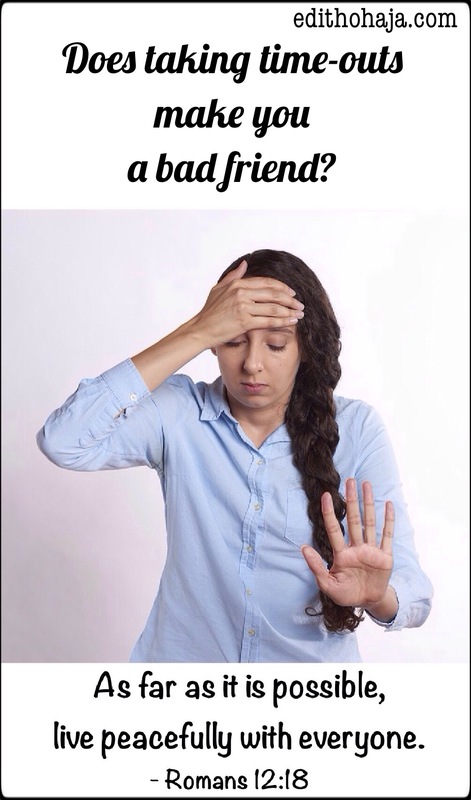 “From the 7 ways you mentioned I can very much say that I’m a good friend, but I feel like when a problem arises in the relationship I handle it in a certain way, which makes me question if I’m really a good friend. For instance, I always withdraw from my friends anytime they offend me. I will just give you the silent treatment and probably ignore your calls and avoid you for days, I’d rather not talk to you than confront you until I get over it, then I go back like nothing happened. Is this a good thing in a relationship?” – Ugochukwu O.
I will address this in the context of friendship but I might very well be talking of colleagues, parents, siblings, romantic partners and spouses. Whatever the nature of the relationship, one or both parties may sometimes act in the way Ugochukwu described. I know two Christian friends, male and female. They tend to argue and raise their voices at each other. When it seems to be getting out of hand, the brother leaves. In his absence the sister fumes for a while. The brother too boils but lets his anger go quickly. When they meet again, they try to prevent any lingering feelings from their previous exchange to dictate their interaction knowing that regardless of their limitations and disagreements, they cherish their friendship. It’s natural for us to all wish for only good times between us and our friends and by us, I’m referring to Christians. But the Bible says that offences must come (Matthew 18:7, Luke 17:1). That means that people will surely annoy us at some point. Though misunderstandings are inevitable, it is up to us to decide how to handle them. If the friend concerned means a lot to us, we would be willing to go a long way to heal the rift. If we don’t really care for them, we might allow the relationship to deteriorate and subsequently die or we might end it right away. Taking time-outs is a common strategy many use right after the heat of their quarrels with friends. As Ugochukwu explained, it may consist of physically steering clear of the friend and/or temporarily suspending communication with them. If we must be in the same environment, we avoid that person as best as we can for a while. I would not like to use the term “silent treatment” because it carries a highly negative connotation and falls in the realm of emotional abuse and control. Here I am talking of someone who wants peace of mind and cordiality and opts out of interaction momentarily when discord arises so the dust can settle. As good as our intentions may be, doing this without notice would appear rude and inconsiderate, especially when the friend is trying to contact and engage with us. Their pride and self esteem could take some knocks from our behaviour. In response, they could get mad and escalate the quarrel. On the one hand, they may feel they deserve better; on the other, their feelings of unworthiness may be reinforced leading to an attempt to end the relationship before further hurt is inflicted. They could also be concerned about us, worrying about our wellbeing while we remain unreachable. To be clear, taking time-outs is not generally a bad idea. It’s actually recommended. When a quarrel creates bad blood between us and our friends, we may need some space to work through our emotions. 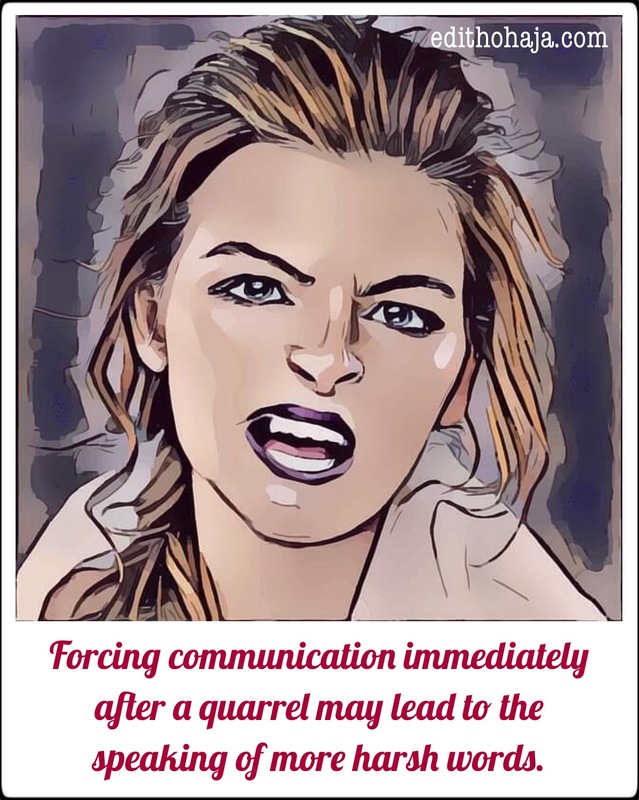 Forcing communication immediately may lead to the speaking of more harsh words which wouldn’t be the case if both parties had taken some time to cool off. What matters is that we are taking the breather for the right reason (to sort ourselves out, not to hurt our friend) and that we don’t drag the time-out too long. If we’ve known the friend involved for long, they will probably give us the space we need without stress. As to the time, a few hours should suffice as the Bible admonishes that we don’t go to bed angry (Ephesians 4:26). What if the matter came up at night? Then I think we have less time to fix it. Bringing our feelings before the Lord is very helpful in healing our wounds and regaining our emotional balance. The foregoing may sound simplistic because there are times when there is a lot of baggage to deal with in a relationship. In such cases, we would naturally need more time to process our thoughts and make decisions. It wouldn’t be right to just disappear, rather we let our friends know we will be apart for a while. But allowing such a separation to linger may be counterproductive. I recall the story of the rift between David and his son, Absalom, after the latter killed his half-brother, Amnon, in 2 Samuel, chapter 14. He fled to his mother’s country after the incident, but when Joab, David’s army commander, noticed that he was yearning for the young man, he arranged to bring him back to Jerusalem with David’s permission. Two years later, David still refused to see Absalom. Then this happened: Absalom sent for Joab to take him to David but Joab ignored him. In response, Absalom instructed his servants to burn Joab’s field adjoining his. When they did, Joab came to ask why and Absalom insisted he should be taken to David. Joab did take Absalom to see David. Father and son reconciled but I feel Joab had it in for Absalom henceforth with the result that when he rebelled against David, Joab didn’t hesitate to kill him once he had the chance, David’s earlier impassioned plea to his commanders to spare the young man’s life notwithstanding (2 Samuel 18:5-17, 28-33). David suffered a heartbreak from that tragedy that I doubt he ever recovered from. So no matter how grievous the offence, if we wish to continue with the relationship, we need to get together and resolve our differences as soon as possible. Whether we bring up the matter that led to the quarrel when we get back together with our friend should depend on what actually happened and how serious the matter is. If it was just a silly misunderstanding, we can forget it. We may have got angry because we were tired, stressed from work or whatever. No need stirring those waters again. It’s wearisome discussing every little issue that arises in a relationship. The love we have for one another and God’s grace in our lives should take care of most, if not all of them. However, if we took offence at some hurtful things our friend said, it may be necessary to request that they not speak like that again. If they didn’t realse they hurt us, it would be better they know so they can be more thoughtful in future. If our friends are demanding we do something we abhor, we need to insist that they desist from pressurising us on the matter. By and large, it is better to discuss serious sources of conflict than sweep them under the carpet. Above all, we should not relate with people carelessly. We should entrust our relationships to the Lord so that we can be a blessing to others and they can be the same to us. And when any relationship has run its course, we should be sensitive enough to drift away as the Lord leads us. The scriptures used in this post are from the King James Version of the Holy Bible. I advise that you do whatever can give you relief from the anger because what sails another's ship may sink yours... But also learn how to control egos in matters like this. True, pride is not compatible with Christianity. You are lifted in Jesus' name. Thanks a lot, Winifred. God bless you very much in Jesus' name. I think is very crucial to control our anger or better still stay calm and avoid using more words when we are angry and when the individual is in a better mood, both parties can settle the problem amicably. Then the relationship would grow in a healthy atmosphere. And on the aspect of accepting our mistakes, that cannot be overemphasized going with the fact that it seals the crack which could wreck the relationship. Nice thoughts. May God surround you with good friends in Jesus' name. AGREED! and thank you for the wonderful Bible references. Love you Edith! You are blessed indeed. Glad to hear from you, Tammy! Special blessings on you and your famy in Jesus' name. I don't think it's a bad idea. Rather, it strengthens the relationship. Hi Frances! It's well with you. Taking time-outs in a relationship is not a bad idea, it is infact necessary in some cases. For instance, in a situation where two friends engaged in a verbal fight, which resulted to a lot of unturned events which occurred in the past. Definitely pride will come in and there will be a silence barrier because each Party will be expecting an apology from the other and the question will be "who will go first?" One thing we should know is that it is not because u are wrong that you should apologize but because it's the right thing to do and misunderstanding is inevitable in every relationship. Now in such cases, u need a "time-out. "Remembering all that you have invested in the relationship. It's not easy to apologise when you're certain you're right. And you don't want the other party to feel you will always be the one apologising lest they think you're needy. But if we are Christians, we should put aside such considerations for the sake of peace. May God give you the best friends, Daniel, in Jesus' name. Sometimes the whole friendship thing gets so tiring you just wanna quit and be alone. People are fickle. I feel we should be willing and ready to let people go, and not hold on to any one for so long. If the friendship is really valued, there's no need for time outs. Everything is talked and trashed out to avoid repetition of the action or actions that caused the misunderstanding in the first place. If you don't speak up, it'll always be a burden in your heart. Communication is key in every relationship. If u can't confront your friend, are you guys really friends? It means the person isn't even worth your time and expression. Taking time-outs can damage a relationship especially when the person doesn't understand what you doing and why you are doing it. For me, I'll prefer to tell that friend what ho or she did to me and we'll reconcile immediately rather than taking time-outs. I really don’t know how to distance myself from friends, I prefer we smoothen things out regardless of what caused the strife. As long as the friction does not make matters worse. You're blessed, my dear! Taking out time in a relationship is considered right or wrong depending on the reason for taking out time. If your reason for taking out time is right then You Should not allow it to take too long before you get together again, and you must inform your partner on your decision to avoid misunderstanding. It is equally assumed that you've settled everything which made you take some time out therefore, you are not meant to discuss the issue again. Ummm, I'm not sure there'll be need for a time-out if everything has been settled. Bless you! 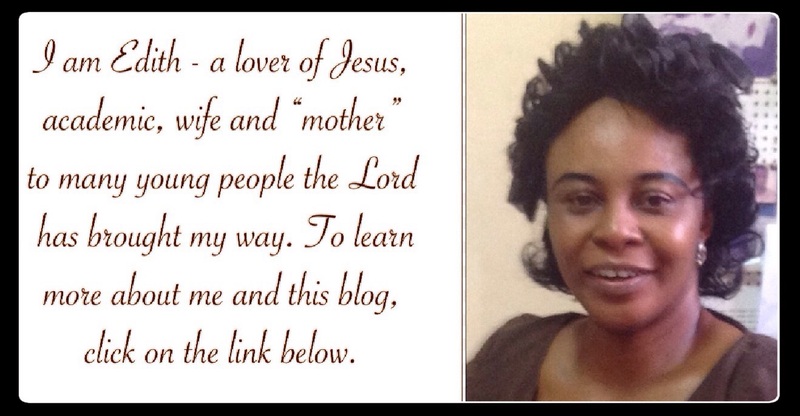 Mummy, I don't know how to express my gratitude for your unceasing posts of encouragement. The precepts in this post have been my guide always in relating with my brother. Has the reverse been the case, who knows what might have happened. So, once more I say: "Mumi m, daluooo!" For me I avoid talking back when am angry because I might start crying and be forced to make a decision I will end up regretting.....so I think giving the relationship a break for a short period is cool,it works for me. I don't think it's a good thing to do, I believe in a relationship what makes it to grow stronger is the ability to settle any misunderstanding that comes immediately not taking a time out cos when u finally get bck wit the person, it won't b like before. It's true that some awkwardness may develop between friends after a time-out but considering the viciousness of some friends' attacks on each other when they quarrel, trying to force interaction at such heated moments may be unadvisable. Cheers! Timing out seems to be the best option one can take due to the kind of facial expression they get from the person they are angry with.I've been in this situation countless times and sometimes I just keep quiet and cry out my anger just to avoid any regrets in the future. Like a saying,"words said while angry can be forgiven but not forgotten"
Taking time outs in a relationship isn't so bad but if that time out last for an unexpected amount of time, the other person might feel offended. Trying to interact after the heat of an argument is toxic to relationship, but after a while, when the other party is calmer, you can talk. I would say, taking a break in a relationship or not talking back when you guys are in a quarrel is a very good thing. I myself love to give my friends break, because I feel they need that space and got their lives to live. Such an educative piece. . I think everyone need to read this as it captures human relationship with one another on a daily basis. It is good that we know how to associate with one another at all times. One lesson I learnt from this is that taking time outs does not make us bad and that we should always try as much as possible to make amends and return to good terms with our friends, as allowing it to linger for so long is not good. Taking your time out in a relationship is good but when it exceed an amount of time, one party, mostly the offended may bear grudges. Sometimes in our anger we say things we shouldn't to people we love. It is advisable to just leave and take some time out to yourself whenever you have a problem with a friend. If you decide to still stay, you might end up making matters worst for yourself and your friend. This is Wisdom. Time outs can be considered by some persons as malice. When a misunderstanding occurs, sorry does not just wipe out the fact that something happened. That period of doing of away with the rift caused by the misunderstanding is time out. Make sure your reasons for giving yourselves space is we'll understood. Thank you for pointing this issue out. I think taking time-outs isn't a bad thing so long as we want to sort out our feelings out and not hurt the other person. May we be guided as we deal with issues that come up in our relationships. Also, it's best to inform the other party if we want to end a relationship than to remain sulky. Yes ma, as long as it doesn't exceed a period of time,timeouts help to a great extent in making the relationship or friendship stronger. THANKING GOD FOR 2018: DO JOIN ME!